well leave the scarf at home. you don't need to be starting that while on the road. 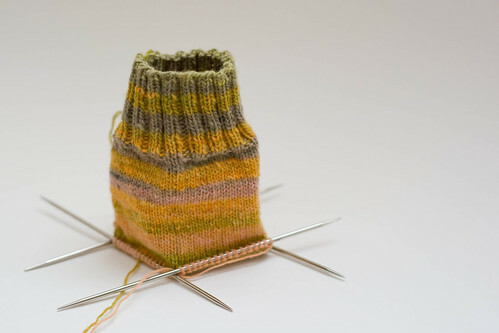 take the sock, because you're so close to being done and it's mindless. then the mittens or snail. or both. i like that purple/green combo too. how can you even resist working with that green heaven for even a second?! Sock. 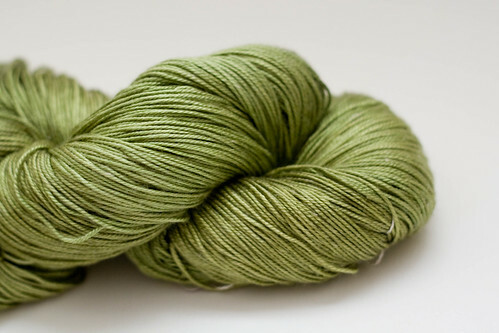 No need to juggle a pattern and multiple and/or slippery yarns on the plane. Mittens and sock. 'Cause I love the green and purple. I'm having a similar issue because I'm going to California in a week. I'm thinking Chevron Scarf and some socks. Or maybe arm warmers. If I brought the shawl, would I really work on it? if that hanami is for me then you know how i vote. Caro - how are you going to do a mini -- shorten the rows width-wise? I vote for the sock. It would be easy to pick up and start at will and can tolerate the interruptions that occur during travel. Oh have fun in my home town and lob a Molotov cocktail at the Excel center for me, k? Oh, definitely the mittens! 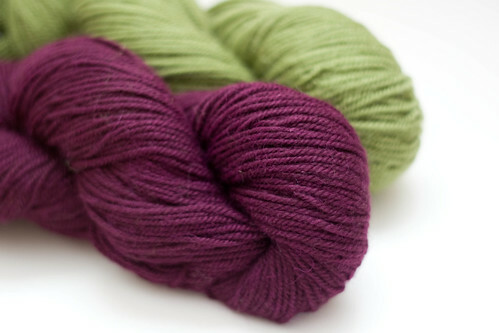 I love that purple and green yarn! seasilk, if only because then i can live vicariously. Sea Silk + lace + beads = lovely. Sea Silk + lace + beads + airplane = disaster waiting to happen. I'd take the socks and the mittens. Boy, do I love that purple and green combo. So pretty. I think socks are the perfect travel knitting. Then the mittens. My inner knitter/traveler is screaming take them all. Realistically, take something mindless, and take the mittens, cause I really want to see what gorgeousness will be! cant exactly help as I am not really a decisive one... but damn I need to figure out how to rig up things for photos like you've got there! Mittens and socks.... gotta get some nice tings to wear for the colder months coming up! What better than new mittens! Hmmm. I'd say mittens and/or sock. I would take both because I'm awful about sticking to one project. lol Have a great trip! Christmas is close so keep knitting the gifts. Sock. Travel is always the sock for me! 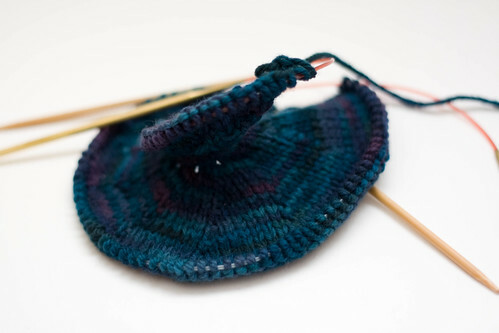 How funny, you inspired me to knit Hanami the first time, and I was just about to start another for myself. Synchronized Knitting!